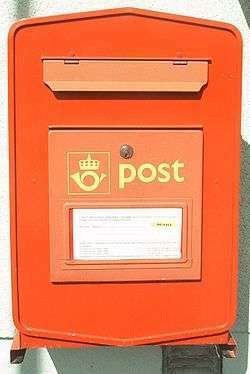 Posten Norge or Norway Post is the name of the Norwegian postal service. The company, owned by the Norwegian Ministry of Transport and Communications has a monopoly on distribution of letters weighing less than 50g throughout the country. There are 30 post offices in Norway, in addition to 1400 outlets in retail stores. Posten was founded in 1647 as Postvesenet ("postal system") by general post master Henrik Morian. It was established as a private company, and the King Christian IV gave his blessing to the founding of the company. Postvesenet was privately run until 1719, when the state took over. From that point on, national postal service was a state monopoly. Local city postal services remained private, but in 1888 a new postal law was introduced which expanded the monopoly to the entire country. In 1933, Postvesenet was renamed Postverket. In 1996, Posten Norge BA was established as a state-owned company in which the Norwegian state had limited liability. In 2002 Posten changed its corporate structure to that of a stock company, to prepare the company for the expected deregulation of the Norwegian postal market. Posten Norge AS is still fully owned by the Norwegian state and the liberalization process has been postponed until 2011 by the government. In 2002 Norway Post acquired 57% of the shares of a private Swedish postal company, CityMail and acquired the remaining 43% in the first quarter of 2006. Norway Post also owns, or partly owns Nor-Cargo as well as Frigoscandia, Pan Nordic Logistics, Scanex B.V., Nettlast Hadeland, many of which have their own subsidiaries. ↑ "Official accounting numbers from proff.no". 2014. Retrieved 2016-04-01. ↑ John Thomas Aarø (2012-06-17). "Reisen fra 3.500 til 30 postkontorer - Media - E24". E24.no. Retrieved 2015-09-20. ↑ "Posten Norge AS". Store norske leksikon. Retrieved October 1, 2016. ↑ "Milestones in Norway Post's history". postennorge.com. Retrieved October 1, 2016. ↑ "Østre Borgesyssel prosti". arkivportalen. Retrieved October 1, 2016. ↑ Norway Post Archived February 12, 2007, at the Wayback Machine. ↑ Divisions and corporate staff units Archived December 28, 2005, at the Wayback Machine. ↑ Torbjørn Skramstad. "Telenor ASA". Store norske leksikon. Retrieved October 1, 2016. ↑ Torbjørn Skramstad. "Evry ASA". Store norske leksikon. Retrieved October 1, 2016. ↑ "Nor-Cargo". Store norske leksikon. Retrieved October 1, 2016.